This is a marriage of several recipes that we love. The original inspiration was from a post on Instagram by Julia Flowers @SnackHappy. Over time, we added our own twists and now it has become one our favorite meals! We usually prefer to pile all of the ingredients in butter lettuce leaves, but you could also use flour tortillas, pita bread or even just make a bowl out of it. Place 12 figs in a bowl with ½ cup of hot water. Let the figs soak for 5 mins. Toss figs and the water they were soaking in into a food processor or high powered blender. Blend until smooth. Paste can be stored in the refrigerator for up to a week. In a small bowl, whisk together the lime juice and olive oil. 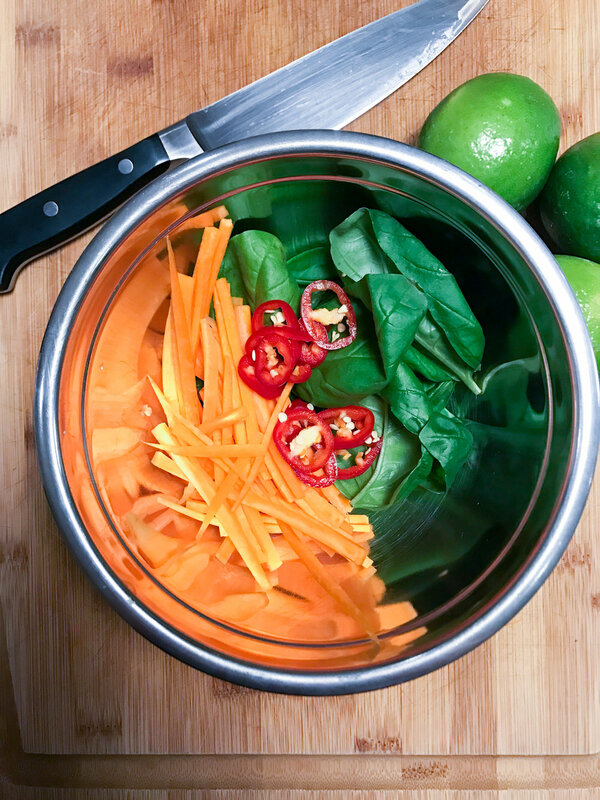 Add the carrots, jalapeno and basil to the dressing gently toss to coat and set aside. Whisk together the coconut aminos, tamari, fish sauce, lime juice and honey. Set aside. Melt coconut oil in a pan. Sauté garlic and ginger until fragrant, about one minute. Add ground beef, break up in the pan and cook until no longer pink, 8-10 minutes. If needed, drain the fat. Add the coconut aminos, toasted sesame oil and Fig Paste. Stir until paste dissolves. Add the arrow root, red pepper, salt and pepper. Cook until the sauce thickens and the meat has browned. Transfer the meat to a bowl and toss with scallions and sesame seeds. Serve the Thai beef with a bowl of Cauliflower Rice alongside the garnishes and the sauce. Let everyone make their own wraps with the butter lettuce or forgo the lettuce altogether and just eat it right out of the bowls! Yum! *Depending on what kind of beef you use, you may have to drain a bit of the fat. Leave about a tablespoon of fat in the pan.